King Digital, maker of the wildly popular Candy Crush video game, got a sour welcome on Wall Street Wednesday as shares tumbled some 15 percent in their first trading day. King’s initial public offering (IPO) raised $500 million from the sale of 22.2 million shares, as the British company sought to capitalize on the popularity of Candy Crush Saga, which boasts some 97 million players worldwide. The shares trading under the symbol “KING” opened lower than the offering price of $22.50, and ended the session on the New York Stock Exchange with a loss of 15.56 percent at $19.00. The slump gives King a market value of $5.98 billion, below the optimistic estimate of $7.6 billion. “This is not a surprise,” said Trip Chowdhry, analyst at Global Equities Research, who said King was seeking to cash in on a fad. “This company is going to be the next Zynga unless they do something very different,” Chowdhry said, referring to the troubled social games maker. The business makes money from players buying hints and other help to aid their climb through some 500 levels of the Tetris-like game. But some analysts have questioned King’s staying power on the back of a game whose popularity could wane over time as users tire of it. The company’s follow-up games have not attained the same level of popularity. 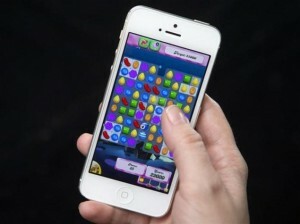 The company says its games, which also include Farm Heroes and Pet Rescue, are installed on 600 million mobile devices, and played over 1.4 billion times a day more than one billion alone for Candy Crush. Profits in the fourth quarter reached $159 million. The King IPO comes amid a sharp uptick in new companies entering the market. The US IPO count stood at 46 through March 11, the highest level for this time of year since 2007, according to Dealogic. King’s arrival comes as investors are keen to buy into the next rising technology star but are wary of young companies being overvalued, especially in the world of games where popularity can be fleeting. Some analysts also fear that the rush of IPOs may signal an overvalued market similar to the tech bubble that burst in the early 2000s. Zynga, creator of the once-mighty “FarmVille” game, lost 40 percent of its value after entering the market in December 2011 with a valuation of $7 billion. “A key principle for King is that no individual game session should take more than a few minutes,” King Digital chief executive Riccardo Zacconi said in the filing. King said the proceeds from the IPO would go for “general corporate purposes,” possibly including acquisitions.